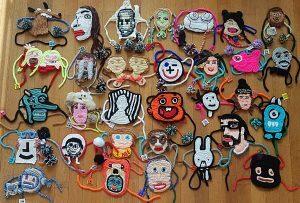 Since 2013 Anne-Marie Ros makes Mobile Guerrilla Knits. Unique cool-in-wool portraits, based on Facebook Profile Pictures. Each hand-picked by her for the only reason that the image inspire her. The profile picture becomes her so-called muses # and when the cool-in-wool portrait is finished, Anne-Marie looks into who is behind the image, to than celebrate the person on the Mobile Guerrilla Knits Facebook page and Ros-projects site. One day my so-called muse will receive his or her cool-in-wool portrait – hand-delivered by me or in the mail. Fun, for them to tag the unique Mobile Guerrilla Knit® anywhere they like, as a tangible reminder of our digital or real-time encounter. Until then I want to show them around the world, so if you have a project-space, do feel free to invite me to show my more than 30 cool-in-wool muses.